A classic design inspired by the Riviera, Foremost's French Mist showerhead whisks you away to a simpler time. Invigorating drops of water cascade from the face of this chrome showerhead, which features an incredible 92 openings. Let quality craftsmanship Also available in store by special order only see store for details. The Rainshower F-Series 10 in. showerhead delivers relaxation and revitalization in an elegant contemporary design. At 10 inch sq. with a-1/2 inch depth, it is generous in size yet ultra-sleek in profile. The showerhead mounts to the ceiling, offers one spray mode and incorporates a ball-and-socket joint that enables it to rotate, allowing users to direct the water where it's needed. A total of 120 spray nozzles and GROHE DreamSpray features advanced shower engines to deliver precise and consistent water distribution throughout any spray pattern for an unparalleled and custom showering experience technology ensure a truly immersive shower experience with full coverage and even water distribution, while GROHE SpeedClean prevents limescale buildup. The Rainshower F-Series 10 inch recommended for use with a variety of GROHE Rainshower arms. In2ition 2-in-1 Showerhead with H2Okinetic Technology in Chrome Best in power and style, this showerhead hand shower combo from Delta gives you an all over clean with every shower. Its 2-in-1 design offers easy use, so rinsing away soap and shampoo is a breeze. It measures 11.13-inch D, 47.25-inch H, and 6.63-inch W to give you a quick and easy way to update your shower. 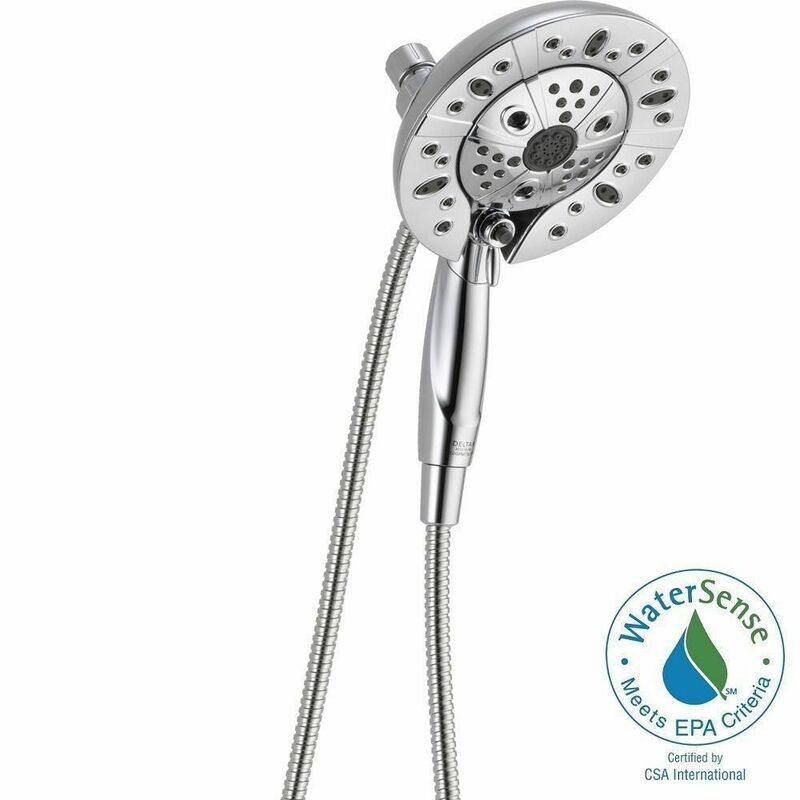 In2ition 2-in-1 Showerhead with H2Okinetic Technology in Chrome is rated 3.7 out of 5 by 228. Rated 5 out of 5 by Kristen from Best shower head ever. Very easy to install.... Best shower head ever. Very easy to install. Rated 5 out of 5 by JB from Installed in less than 10 minutes. Has a wide spread of water. The only issue is not the fault ... Installed in less than 10 minutes. Has a wide spread of water. The only issue is not the fault of the showerhead, but of the water pressure supplied by the city. Will be adding a water pressure booster to take full advantage of this most excellent showerhead. Rated 5 out of 5 by MM from This is the second time I have bought this device.... This is the second time I have bought this device. The other was an older model. I love that you can you the handheld to clean the shower walls, pets, etc. The magnetic attachment is great. Love the way it functions. Rated 4 out of 5 by JJ from Had it for a couple weeks now. Very easy to install. Good pressure on all modes. When the middle ... Had it for a couple weeks now. Very easy to install. Good pressure on all modes. When the middle is on full mode it is a bit noisy when on pause. Overall met expectations. Rated 4 out of 5 by Higster from We love the 2-in-1 feature of a showerhead/handheld combination. Pressure is much better than ou... We love the 2-in-1 feature of a showerhead/handheld combination. Pressure is much better than our previous showerhead. And, while we have only hand the product for about one week - so far, so good.